The morning after a six-hour battle at the mouth of the Cape Fear River, Fort Fisher lies in ruins under a chilly drizzle. The mysterious explosion of the main powder magazine at dawn has left a yawning crater in which are entombed hundreds of men who survived the earlier battle, blue and gray alike. The Federal commanders — Gen. Alfred Terry and Adm. David Porter — envision a quick thrust up the peninsula to capture Wilmington while its shipyards and railroads are still intact, before ammunition and stores can be spirited into the countryside, before its garrison can escape and its hundreds of Union prisoners can be evacuated. Secretary of War Edwin M. Stanton arrives, bearing a round of promotions, on January 16, 1865, and is presented with the Confederate battle flag that flew over the Mound Battery, just north of the surrender site. President Lincoln sends his congratulations. In Virginia, Gen. Ulysses S. Grant orders a 100-gun salute fired by each of the U.S. armies in the field — then travels to the Cape Fear for a council of war. Union Army and Navy forces have suffered as many as 1,000 casualties — among them some of their most valuable field officers. Brig. Gen. Newton Martin Curtis, the imposing commander who led the land-face assault that turned the tide, was blasted in the face by shellfire on the traverse and blinded in his left eye, part of his face shot away. Meanwhile, the captured Confederates are shipped north to Fort Delaware, Fort Monroe, and other grim prison camps. Among them is Maj. James Martin Stevenson of the 36th North Carolina, who commanded the lower sea-facing batteries. His son, signalman James Chapman Stevenson, escapes Battery Buchanan in a small boat. He turns back to look for his ill father, but rockets signal that the fort has fallen. He will never see his father again. The day after the surrender, Daisy Lamb, wife of the wounded commandant of Fort Fisher, approaches the Federal lines facing Sugar Loaf under a flag of truce, seeking her husband. She is sent away. But Bragg, indecisive and irascible as ever, won’t even entertain the idea. Residents fear he has already determined to abandon Wilmington. He orders a complete blackout of all war news, and he withdraws all his remaining forces on the east bank to Sugar Loaf, about six miles north of Fort Fisher, under Maj. Gen. Robert Hoke, a native North Carolinian and veteran of the fighting in Virginia. On the west bank, Fort Holmes on Smith’s Island and the garrisons at Smithville and Fort Caswell downriver are evacuated, leaving behind precious guns and ammunition. Forces under Brig. Gen. Johnson Hagood concentrate at Fort Anderson, directly across the river from Sugar Loaf. Hagood, a lean aristocrat from South Carolina, is also a veteran of Petersburg, where his brigade lost 6 men in 10. Now he is woefully short of troops and soon will be outnumbered by at least 3 to 1. On both banks of the Cape Fear, Bragg fields a combined army of fewer than 7,600 soldiers — and in the course of the next few weeks, about 900 desert their posts, disappearing into the swamps and woods. The 6,000 Union assault troops have been badly cut up. Gen. Alfred Terry sends one foray toward the Confederate lines at Sugar Loaf: the 4th, 6th, 30th, and 39th U.S. Colored Troops. 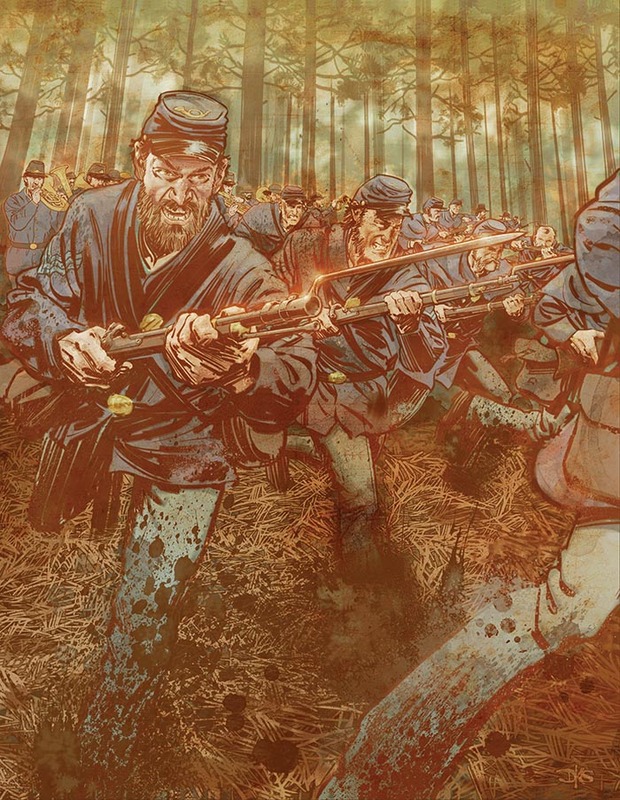 But in a hot three-hour firefight, they cannot breach the Confederate position and withdraw. One officer explains that the entrenchments at Sugar Loaf are formidable, the same style of defensive ramparts the Federals face at Petersburg. Now the Union troops endure the raw, primitive conditions of the sandy peninsula for a full month before reinforcements arrive and they can begin their march on Wilmington. The main fleet disperses, but 30 Monitors — flat-hulled ironclads with revolving turrets — and other gunboats remain to support the Union advance up the river. Admiral Porter orders that all the signal lights at the fort be maintained, to lure in unsuspecting blockade runners. On the night of January 16, Cmdr. John Newland Maffitt, who once charted the river for the U.S. Navy, slips his sidewheeler Owl through the inlet to Smithville, where he is warned off. Owl sails back out to sea. General Grant has decreed that Wilmington must be taken in order to supply Maj. Gen. William T. Sherman with an open port. Sherman marches north from Savannah, Georgia, on February 1. Grant orders Brig. Gen. John M. Schofield to transport his XXIII Corps — 21,000 strong — from Alexandria, Virginia, to the Cape Fear and to assume command. A three-pronged attack pushes along both banks, with the gunboats plowing upriver in the middle and providing covering fire against Confederate artillery. They keep up nearly constant shelling, wreaking havoc, while the Confederate shells literally bounce off the Monitors’ iron plating. One of those “good soldiers,” a former slave, captures a Confederate officer and leads him to the rear, declaring, “He’s my prisoner, ole massa is.” And indeed, the prisoner confirms he once was slavemaster to the soldier herding him toward the holding pen. It is the first of several remarkable reunions. The USCT push back parts of the line at a heavy cost: 16 killed and 76 wounded. But the main Confederate line holds. Cox outflanks Hagood, coming in behind Fort Anderson — built in an L-shape on the model of Fort Fisher, with no battlements in the rear. As the blue troops charge through the marshy pine flats with fixed bayonets, the brass band of the 104th Ohio Infantry urges them on with patriotic tunes. The Eutaw Regiment Band of the 25th South Carolina Infantry Regiment fights back with its own tunes. Over the rattle of muskets and the booming of cannons can be heard the strains of “Who’s Been Here Since I’ve Been Gone” — an old fiddle tune about a soldier returning home to find that his wife has taken up with his own brother. Hagood withdraws to Town Creek, a deep, unfordable tributary of the Cape Fear, leaving his dead laid out in the ruins of St. Philip’s Church. With Fort Anderson directly across the river in Union hands, Hoke cannot hold Sugar Loaf. He falls back on the junction of Federal Point Road and a small local lane — Forks Road — some three miles south of the city. His men entrench behind heart-pine breastworks fortified with mounded sand. Now his brother, Cpl. Hosea Horne, of the Wilmington Horse Artillery, is posted with his two-gun battery at Forks Road. During the battle to come, while one son attacks the other, their mother will listen to the cannonfire from her front porch. Again the USCT strike in the vanguard, the 5th USCT leading the way, taking heavy casualties but unable to dislodge the stubborn defenders. But events across the river decide the fate of Wilmington. The only two bridges across Town Creek are sited with deadly accurate artillery and rifle fire. But a local slave shows Cox’s scouts the whereabouts of a cotton barge, and two of Cox’s brigades — 75 men at a time — cross Town Creek east of Hagood’s lines, and once again outflank him. Three thousand Yankees charge with bayonets across a field of broomsedge, and the firing rises to such a “perfect roar” that it sets the grass on fire. Hagood’s men fall back, leaving open the road to Wilmington. The retreating Confederates burn their bridges behind them, but Union engineers soon repair the bridges and reach the city in darkness on February 21. Some remain on the island separating the Cape Fear and Brunswick rivers, Eagle Island — site of the Beery shipyard, a cotton compress, warehouses, docks, and the depot of the Wilmington and Manchester Railroad. They methodically burn the railroad trestle and destroy everything else of value. Across the river, cotton bales are burning, tobacco is being dumped into the brown current, and warehouses and docks are aflame as the easterly wind carries the fire from rooftop to rooftop — stopping only at the river itself. As the 16th Kentucky and 65th Illinois advance onto Eagle Island, a battery of cannons across the river at the foot of Market Street opens fire. The rifled guns of the Ohio Light Artillery return fire, slamming accurate shots into riverfront buildings, and Hagood quickly orders his own guns to cease fire — he does not want the Yankees to level the city. 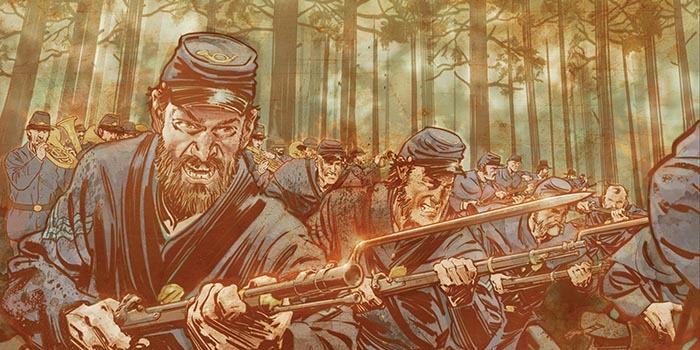 Before dawn on February 22, a reconnaissance party finds that the Confederates have abandoned Forks Road. General Schofield wastes no time. He orders Terry to advance on Wilmington. Though the USCT fought in the vanguard of the assaults at Sugar Loaf and Forks Road, they march in the rear of the white troops. But they are cheered by white and black citizens alike — though the wealthy class is conspicuously absent from the throng. One mother embraces her son, who left home a slave and returns a free man in an army of liberation. General Terry dismounts his magnificent bay warhorse and approaches Dawson. “Is this the mayor?” he inquires. It is February 22 — the birthday of George Washington, the secular saint of the Southern Confederacy, whose portrait hangs in the war room of the Confederate White House in Richmond, Virginia. To the Union troops flooding into the city, the anniversary is a favorable omen of destiny. At noon, the river fleet fires a 35-gun salute — one for each state. Before long, emaciated Union prisoners from Salisbury and Andersonville stream into the city at the rate of 1,400 per day for a whole week — nearly 10,000 in all. One of them, Benjamin F. Booth, will publish a shocking indictment of his jailers at Salisbury, taken from his detailed diary. The prisoners are joined by as many as 10,000 “contrabands” — blacks freed by Sherman’s army advancing through the interior. The Stars and Stripes flies over the U.S. Army headquarters of occupation, in the finest mansion in the city, constructed partially by slave labor: the home of Dr. John D. Bellamy, who once sponsored a torchlight parade to celebrate the secession of the Old North State. Bellamy returns from Floral College in Robeson County, where he and his family have been waiting out the war. They are attended by nine household slaves and well-supplied with provisions from his plantations. He applies to Brig. Gen. Joseph R. Hawley, General Terry’s chief of staff, newly appointed commandant of occupied Wilmington, for permission to enter the city. 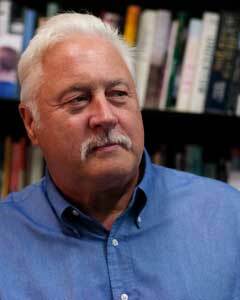 Philip Gerard is an author and a creative writing professor at the University of North Carolina Wilmington. He is also a commentator on WHQR-FM (91.3). Find more of his archived stories here.